Help the EFF Save the Future, by Reading Some Brand New Science Fiction! The Electronic Frontier Foundation is out there fighting for civil liberties and privacy on the Internet and the digital world generally. And now, you can help support them—by reading a brand new science fiction book! 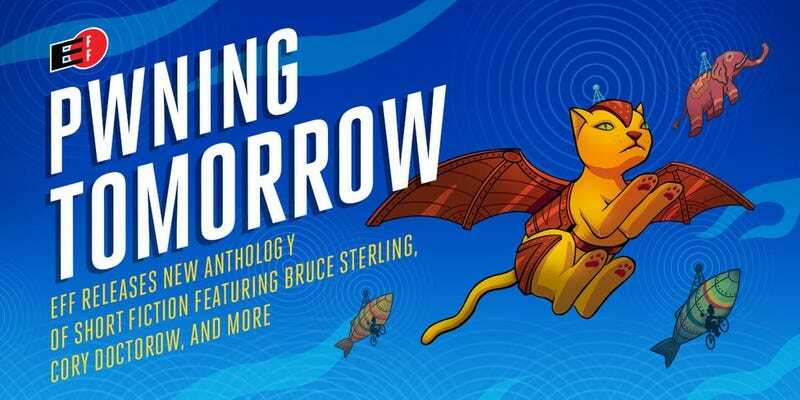 The EFF just published a new book Pwning Tomorrow, featuring short fiction by Bruce Sterling, Rudy Rucker, Cory Doctorow, Annalee Newitz, Kameron Hurley, Neil Gaiman, James Patrick Kelly, Eileen Gunn, David Brin, Madeline Ashby, Paolo Bacigalupi, Lauren Beukes, Hannu Rajaniemi and several others (including yours truly.) The collection ends with a novella by Carolyn Jewel, the lead plaintiff in the EFF’s long-running lawsuit against warrantless surveillance of electronic communications. The book is Creative Commons-licensed, and you don’t have to donate to get a copy. But the EFF is requesting donations of between $25 and $2,500 per copy. You can donate, and download your copy in e-book format, here.